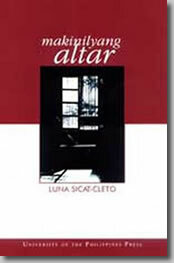 The UP Institute of Creative Writing has announced that this year's winner of the Madrigal-Gonzalez Best First Book Award is "Makinilyang Altar," a novel by Luna Sicat-Cleto and published by the University of the Philippines Press. Cleto has won several literary awards, including the Carlos Palanca Award for her short stories, essays, poems and stories for children; and the Gawad CCP for a one-act play. She teaches at the Department of Filipino and Philippine Literature at the UP and is working on her Ph.D in Malikhaing Pagsulat. Her father is the late Roger Sicat, one of the most distinguished fictionists in Philippine literature; and her mother, Ellen Liwag Sicat, was also a winner of the Madrigal-Gonzalez Award. This award is granted by the Madrigal and Gonzalez families, through Gizela Gonzalez Montinola, writer and granddaughter of Bienvenido Gonzalez, former UP President, and daughter of Gonzalo Gonzalez, former member of the UP Board of Regents. The award is administered by the UP ICW. It is given on alternate years to writers in English and writers in Filipino. The first winner was "Life Before X and Other Stories," a collection of short stories by Angelo Rodriguez Lacuesta. In 2002, it was won by "Paghuhunos," a novel by Ellen Sicat. And in 2003, the winner was "Smaller and Smaller Circles," a novel by F.H. Batacan. This year, the members of the board of judges were Rogelio Mangahas (chair), Fanny Garcia and Fidel Rillo.